Equities have greeted 2018 with a bang, but none more so than Korean pharmaceutical maker Celltrion Inc., which has piled on about 9 trillion won ($8.4 billion) of market value in just seven days. The surge has seen Incheon-based Celltrion -- which makes most of its money manufacturing copies of drugs whose patents have expired -- streak past Hyundai Motor Co., South Korea’s largest automaker, to become the third-biggest company by value on the country’s stock exchange. Its 37 trillion won market cap puts it behind smartphone behemoth Samsung Electronics Co. at No. 1 and chip giant SK Hynix Inc.in second place. In fact, SK Hynix’s 53 trillion-won market cap is now about equal to the combined value of Celltrion and its two subsidiaries Celltrion Healthcare Co. and Celltrion Pharm Inc.
There’s a couple of reasons behind the leap. Celltrion launched a new drug for treating blood cancer in Europe last year, which analysts say got a good reception, bolstering the company’s prospects. 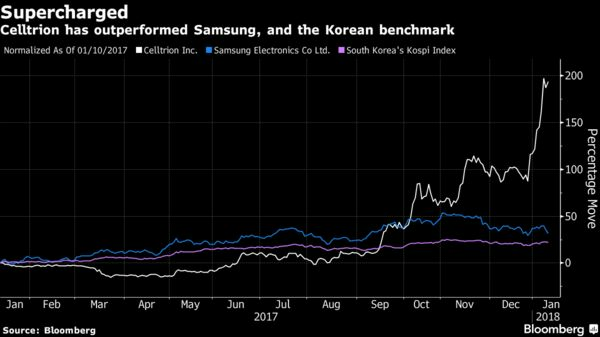 Speculation that Korea plans to boost investment in the small-cap Kosdaq market -- where Celltrion is listed -- has also fueled gains. The shares have rallied every day but one in 2018, after more than doubling last year.